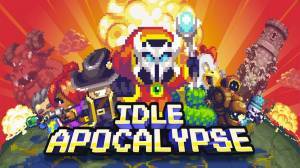 Idle Apocalypse is a free to play pixelated resource management and strategy idle clicker game. The objective is to destroy the world and to do this you need to summon Idols to bring about the Apocalypse. To summon these Idols you must build a tower by collecting materials to unlock various rooms and unlock research stations to discover new technologies. To do your bidding you must craft an army of evil creatures who will also gather the Dark Energy that is required for the summoning. Below is the process that you have to follow in the game. Make sure whenever you return to the game after being away for a period of time you tap the old TV icon in the upper left corner and watch the required number of video advertisements in order to increase the resources dropped by creatures and have your own units inflict more damage. Doing this will also help you to get more Dark Energy. Make sure you regularly visit the generator room and tap it until you max it out. Doing this will increase the speed at which your creatures spawn by up to 20%. This boost will last for 30 minutes, it also works if you are playing the game offline. If you join your minions in their battles you will be able to defeat the champions faster which will enable you to get resource gains quicker. It will also allow you to get access to premium items and rise through the stages faster. To join the battle against the champions you just have hit the swords icon in the top left corner of the screen and then tap your spell icon to inflict damage. It is important that you collect the Dark Energy whenever possible as it is used to summon a demon. You can increase your Dark Engergy production by upgrading goblins, beasts, unlocking the generator, and unlocking boosters at the library. To be able to put together a powerful army of evil creatures you must first build the buildings for your tower. Use the navigation keys situated at the right side of your screen to go to the top of your tower and see what buildings you can unlock. 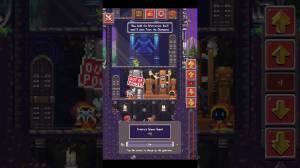 Upgrading a building unlocks a new item or beast. There are some floors that will have more than one room or produce more than one product. You need to swipe left or right on a floor to see if there is another room to build or upgrade. When you construct a new floor or build a new room on a floor it is important that you remember to hit the 'play' button if you need that resources otherwise nothing will happen in that room. Only one product can be produced on one floor at a time, if you press 'play' on the second resource, production of the first resource will stop. This mud farm is the main building and is where beasts such as Goblins are produced. These beasts are important as they go to battle and drop the material which is needed to unlock new buildings or to produce a beast or spell for other purposes. The hatchery is similar to the mud farm in that it produces beasts which you can send into battle and gather material which can be on building. The library is where the material your beasts have collected can be given a boost such as increasing the deal damage or to produce more Dark Energy. The soul is a precious item that can be used to unlock premium boosters so you can progress faster in the game. Obtaining souls can be done two ways, either by unlocking the Idle portal or by summoning a demon. Once you unlock a certain number of buildings at your tower dropshipping will become unlocked. This will give you the opportunity to get free offers in return for watching a video advertisement. Tap on the TV icon that is located at the bottom left of the screen and you will be able to watch a video advertisement in exchange for free boosters. The premium currency of the game is gems and there are several ways to earn them for free. You can win them from spins at the prize wheel, from the drop ship, claiming achievement rewards, and the third party offers. There is also the option to get gems as an in-app purchase if you want them straight away withough having to grind for them. 5The End of an Era? 1740What Game Are You Currently Playing?